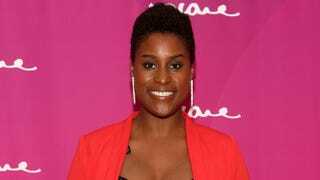 Make no mistake about it: Issa Rae is still on her content-creating grind after the success of her online fictional Web series Awkward Black Girl. Except now she's in Hollywood trying to work with production companies and television networks to get her stuff on television and in front of a bigger audience. To say that this leg of the journey hasn't been easy would be an understatement. In an interview with the New York Times, Rae spoke about how hard it has been for Hollywood executives to understand the vision behind Awkward Black Girl (even though it did so well online), and how some executives have tried to change the concept of the show from its initial premise of chronicling the life of an awkward black girl. One network executive wanted to make it a "pan-racial franchise operation," the Times explains, by casting a different ethnicity in the lead character for each iteration, starting with Awkward Indian Boy. Another executive advised Rae that if she wanted to get her show on TV, she should change the lead character from a chocolate-complexioned black girl (Rae played the lead character) to a lighter-skinned black girl with straight hair. "They wanted to make it as broad as possible, broadly niche, but I was like: No, that’s not what this is about," Rae said. Rae respectfully declined any efforts to reinvent ABG in a way that didn't feel authentic. After a few promising green lights that didn't go anywhere (one project had Shonda Rhimes loosely attached), Rae is now working on an HBO-approved pilot for a show she pitched called Insecure. It's faring much better, but when Rae gave the network a list of young directors and producers of color whom she wanted to work with, it recommended that they go with more seasoned writers. She got a black showrunner, though, so there's that. So much for small victories.